So it's my month in Fresh Modern Bee and I have been saving up a Prints Charming fabric for some time now very generously given to me by Amber (One Shabby Chick) and Jennifer (Bessiemae). 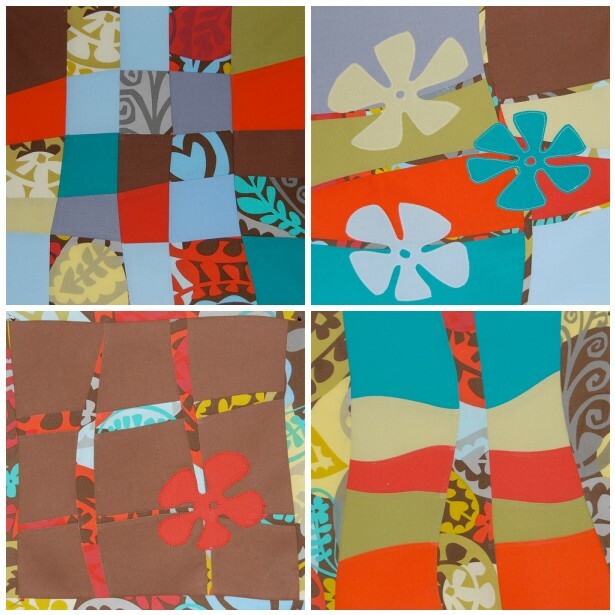 I have mixed this up with a bunch of Kona solids with instructions to my bee members to make 12" blocks inspired by the shapes and lines in the fabric - no straight lines or geometry. Here are my four inspiration blocks. I have one clear favourite but invariably, I have no idea what other people will like so, out of interest, which is your favourite of the four? Top right is my favorite. I have spring flowers on my mind. top right ;) even cuter with the flowers on it now. I'm going to be contrarian and vote for bottom right! Top left show the Prints Charming the best but I really like bottom right! Top right is my fav! Although they are all beautiful! The colours are great together! Top right, or bottom right, cant decide. I do like them all to be honest! top right is my favorite.....but all are wonderful!!! Bottom left is my fave. This looks like it will be a fun month! Can't wait to see what everyone will come up with. I'm partial to the top left .. but the colors are great! Bottom right but I love top left too! Oh I really like top right and then botton left. Love, love love those narrow strips in there! Beautiful! I like the one with the applique flowers. I love the one on the top right, but I also like the feel of the one on the top left as well. Great work! Top right I think. it's spring so it has to be flowers. love them all, but bottom left is fantastic! Lower left for me! Funny how everyone has a different favorite--but we seem unanimous in being crazy about the foursome. top left is my favorite. Bottom right sings to me! Top right and bottom left are my favourites but they are great anyway. I'm really liking the bottom left ... but they are all really nice! Top right! Really great blocks! How did you make the fabric backgrounds? Great blocks! I love the one on the top right and am looking forward to seeing the bee blocks! I'm torn between the bottom two, but if I have to pick I say bottom left!!! bottom left is the best but all four are great fun! If I really had to choose between the 4 amazing blocks it would be bottom left. The fine wavy piecing looks so tricky and the flower adds a focus. Very fresh and unique blocks, and wonderful colors. I love the lower left block most of all. These are awesome, Lynne! I like all of them, but I think my favorite is bottom right, followed closely by top left.